High School Students Complete the DriveWorksXpress Certification! The Certified DriveWorksXpress Associate (CDWXA) is a free certification for anyone with SOLIDWORKS. Becoming a Certified DriveWorksXpress Associate improves SOLIDWORKS skills and makes engineering résumés stand out from the crowd. 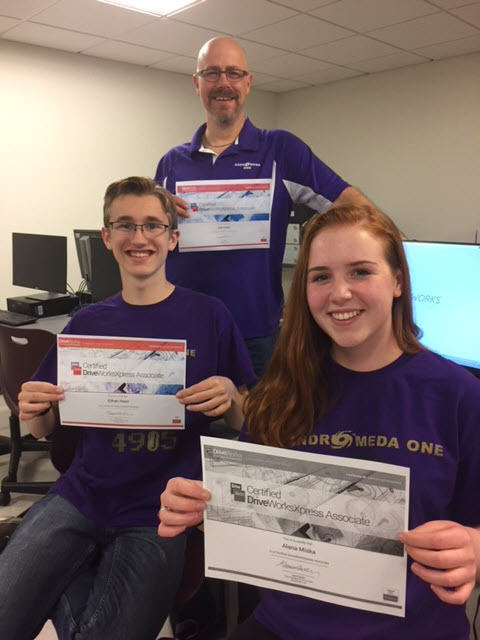 Recently, Ethan and Alana from the First Robotics Team at Ayer Shirley Regional High School added to their SOLIDWORKS skills by completing the DriveWorksXpress Training and Certification, becoming Certified DriveWorksXpress Associates. Although many engineering professionals and university students have successfully completed the training and become certified, Ethan and Alana are the first high school students to do so. They both completed the training quickly and scored exceptionally high, with Ethan achieving a perfect result of 100%. Their CAD mentor, Earl also took the certification and is now a Certified DriveWorksXpress Associate too. Ethan is a 17-year-old Junior at the Ayer Shirley Regional High School in Ayer, Massachusetts. He has been a member of the cross country team for 5 years and also worked on the school’s literary magazine. Ethan has been a part of the FIRST Robotics team since 8th grade. He has worked on the software team and now works on the CAD team. Alana is also a 17-year old Junior at the Ayer Shirley Regional High School. She plays on the high school soccer team and also plays flute in the concert band. She is a member of the National Honors Society. She has been on the FIRST robotics team since its original year in 2014 (when she was in 7th grade). She has been a part of the CAD team every year which is how she first learned about SOLIDWORKS. 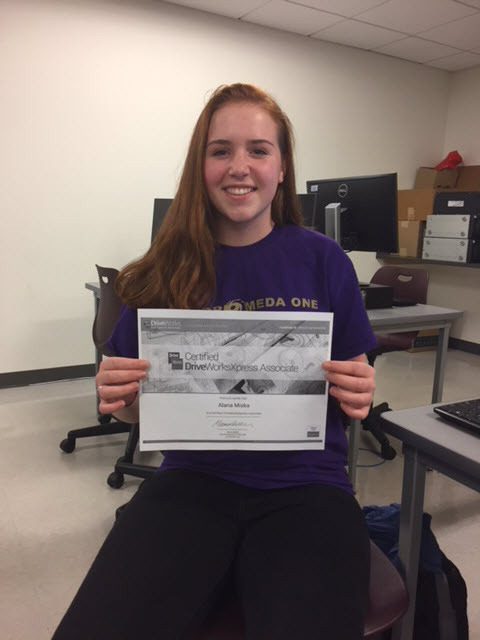 Being on the robotics team has inspired and encouraged Alana to go into the engineering field and now she has an extra certification to take with her. FIRST Robotics team FRC 4905, Andromeda One, at Ayer Shirley Regional High School is a five-year team that has been a growing success. Each year they have expanded their capabilities as the team learns what it means to design and build a competition robot in 6 ½ weeks. Earl has been the CAD mentor for the team for the last four years. Over that time, he has been teaching students how to use SOLIDWORKS to design parts and assemblies needed to build the robot that the team use in competitions. 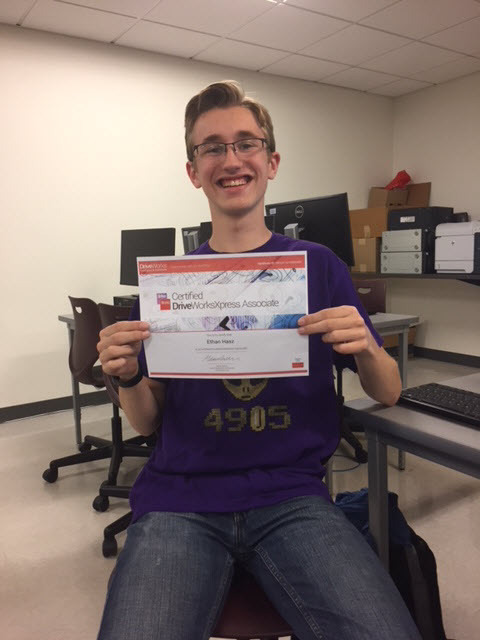 This season he has encouraged the senior members of the team to become Certified SOLIDWORKS Associates (CSWA) and Certified DriveWorksXpress Associates (CDWXA). A huge well done to Ethan, Alana and Earl for becoming Certified DriveWorksXpress Associates. Ethan and Alana have made a great start on their careers in engineering. 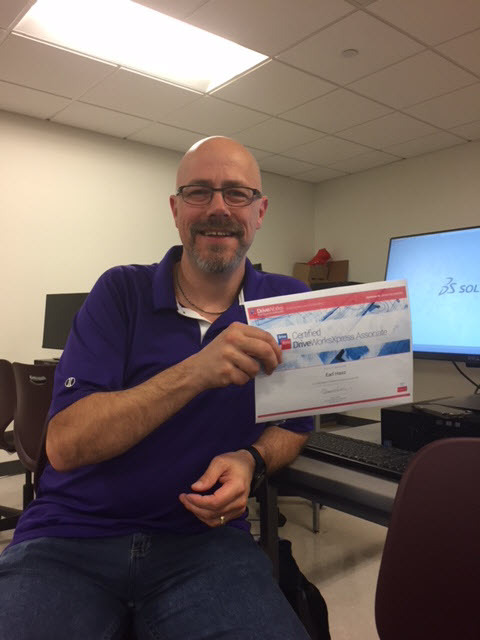 If you’d like to become a Certified DriveWorksXpress Associate, all you need is a SOLIDWORKS license.